Where to start with this one? The Black Knight is a very silly movie. Its hugely-popular star, Alan Ladd, has in only three years since Shane become a self-caricature, playing the same part in every picture, a bluff, laconic good-guy whose solution to every problem is a sock on the jaw. 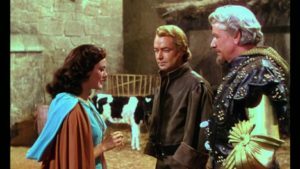 For tax purposes he stayed out of the U.S. for nineteen months in 1952-54, making four films overseas, including this medieval Arthurian travesty. A bluff, laconic smith known only as John (Ladd) forges arms and armor in the Earl of Yeonil’s smithy. John and the earl’s daughter Linnet (Patricia Medina) are in love, but John, a commoner, knows it’s hopeless. A bluff, laconic visiting knight from nearby Camelot tells John not to despair, and reveals that he, too, was once a commoner. “You made your own sword,” he tells John, “now let your sword make you.” This is the only good line in the picture. Cue the Viking raid! Obviously phony Norsemen in crazy horned helms burst into the castle, pillaging and killing. One of them strikes down the earl, then he and his leader set fire to the place and ride away. John pursues, and sees the raiders doff their Viking gear, revealing themselves to be secret Saracens! They ride to Camelot, and John chases them right into King Arthur’s throne room, where he socks them on the jaw. Arthur doesn’t like this because the Saracen is Sir Palamides (Peter Cushing! ), one of his Knights of the Round Table. (No round table appears in this film.) Bound by immutable law, Arthur sentences John to death, but is then reminded that it’s a holiday, so by immutable law Arthur must grant John a boon. John asks for time to prove Palamides is a traitor, and Arthur grants him three months. John does what anyone would do in this situation: he adopts a secret identity! He becomes the Black Knight, wearing a suit of armor he made himself, and this ploy enables him to … well, it’s not really clear how it helps, but stuff happens, the bad guys do more bad things, and John fights a lot, except when he’s galloping off to another fight. There are at least twenty-five minutes of fighting in this eighty-five minute movie, and not a second of it bears any resemblance to actual medieval combat. The knights’ armor is all hilariously awkward and wrong, as if the costumers had never seen a real suit of armor and just copied from bad comic books—couldn’t someone from Pinewood have popped down to the British Museum for an hour? The knights’ helms all have tall lurid totems on top and weird protruding vizors, but in the Black Knight’s case this has the advantage of covering his face, which means all that fighting can be done by Ladd’s stunt double. Now and then the Black Knight pauses in mid-combat, steps back, and they cut to Ladd in rear-screen projection, flipping up his vizor for a moment so you can see it’s really him. Smile, Alan! Meanwhile, there’s treachery in Camelot: Palamides is in league with Arthur’s putative ally, King Mark of Cornwell (Patrick Troughton—yes, the Second Doctor), but Mark is a crypto-pagan who secretly wants to wipe out Arthur and his new Christians because pagans are just like that. The pagans capture Lady Linnet and plan to sacrifice her at Stonehenge, which is complete and unruined, albeit cardboard, but John spoils their fun, and then Arthur orders his knights to throw lassos around the great stones and pull them down. And That’s How Stonehenge Got Ruined. But the naughty pagans and Saracens just won’t give up, even after their Viking imposture is exposed, so John has to sneak into Mark’s castle to steal their secret plans to attack Camelot. He has to do this twice because the first time he leaves without taking the plans, I am not even making this up. Stay to the end to see the newly-dubbed Sir John marry Lady Linnet in a dress made of iridescent cellophane feathers. I think Thomas Malory would dig it.